Set oven control to broil. Spray large rimmed baking pan with cooking spray. In medium bowl, mix lemon peel, lemon juice, red pepper, salt, garlic and oil. Add shrimp; toss to coat. Spread shrimp in single layer in pan. Broil shrimp with tops 4 inches from heat 3 to 5 minutes, turning once, until shrimp are pink and firm. Drain; transfer to medium bowl. Cover; refrigerate 30 to 35 minutes or until chilled. Meanwhile, thread cherry tomatoes onto skewers. Fold basil leaves in half, and thread onto skewers. Thread head ends of shrimp, followed by olives, then tail ends of shrimp. 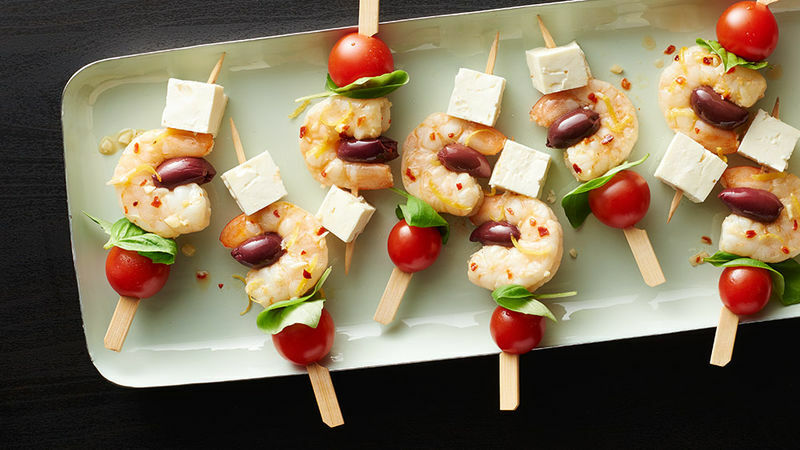 Finally, thread feta cubes onto skewers. Serve immediately, or refrigerate up to 4 hours before serving. If you have trouble threading the shrimp and olives simultaneously, place the olives inside the shrimp before threading. These kabobs look great standing or laid flat. If you’d prefer that a few of them stand in the center of your platter, don’t push the cocktail pick all the way through the feta so that the bottom of the cheese creates a flat surface.